Saita Publications | Free ebooks: Saita Publications is on the pages of EMPLOY (interactive study guide)! Saita Publications is on the pages of EMPLOY (interactive study guide)! Among a lot of interviews of professionals with different qualifications, which are welcomed via QR codes on the pages of the study guide “Choose studies & Career 2014”, Saita Publications makes an appearance as well! Speaking about the profession of philology, the creator of the Publications, Iraklis Lampadariou says much about the interactive, non-commercial initiative of Saita Publications, which is mostly supported by volunteers. We thank EMPLOY for this honor, giving us the opportunity to share our vision for free traveling books, with parents, students and educators. What is “Choose studies & Profession 2014? It is a complete guide for the Panhellenic Exams, the parts of the computerized application form for the entrance to the Greek universities, and the filling out of this computerized form. 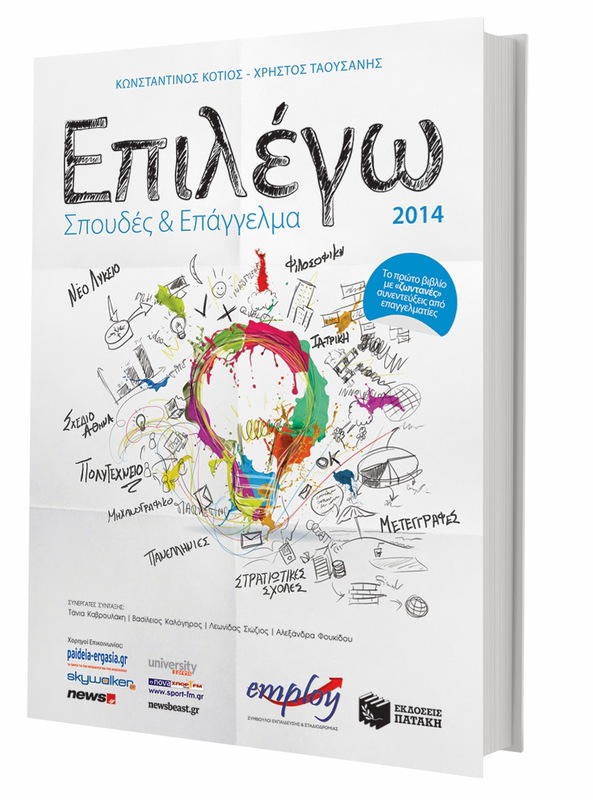 This annual book, more than any other year, is a valued guide for all the departments, which are included in the computerized form of the Panhellenic Exams, after the changes of the “Athena” plan. Only in the particular book, aside from the only innovation of live interviews (via QR codes), you will see in the video, professionals and scientists analyzing schools and professions, you will read details, researches and important information about each department , but also the professional rights and prospects which a degree gives. You will also find exclusive facts for the new departments, for the Military and Police Schools, the new High School, but also the second computerized form, which Greek students are entitled to submit for the public Universities in Cyprus. The authors of the book are members of the science team in the company, EMPLOY. Kotios Konstantinos and Taousanis Christos are career consultants, doctoral candidates in Aristotle University of Thessaloniki, and authors of books about career consulting. They have been the key speakers in dozens of lectures about career consulting, in both Greece and Cyprus, while their research and articles have been published in mass media. For details about the book on Biblionet, press here. The company, EMPLOY which specializes in the area of Lifelong Education of the Professional Orientation and Career Consulting, provides a complete service grid in the particular sectors in all of Greece, via innovative educational and research activities, which make it pioneer in its employment levels. In the company’s individual and educational activities, it has teamed up with renowned Greek academics, it has carried out more than 700 educational activities (seminars, conferences, lectures, etc. ), and more than 50,000 students, parents, educators and scientists of different sectors have participated in at least one activity, utilizing the company’s services.